2 Welcome back into the future! 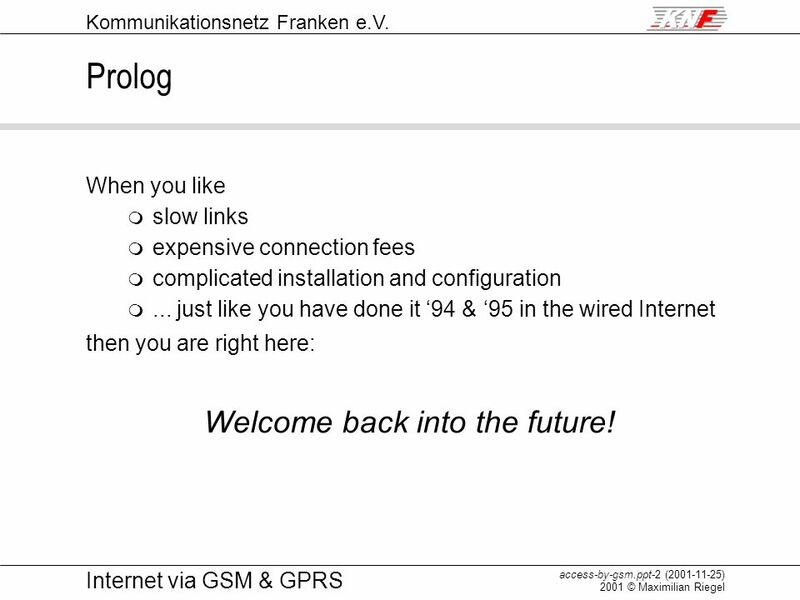 Prolog When you like slow links expensive connection fees complicated installation and configuration ... just like you have done it ‘94 & ‘95 in the wired Internet then you are right here: Welcome back into the future! 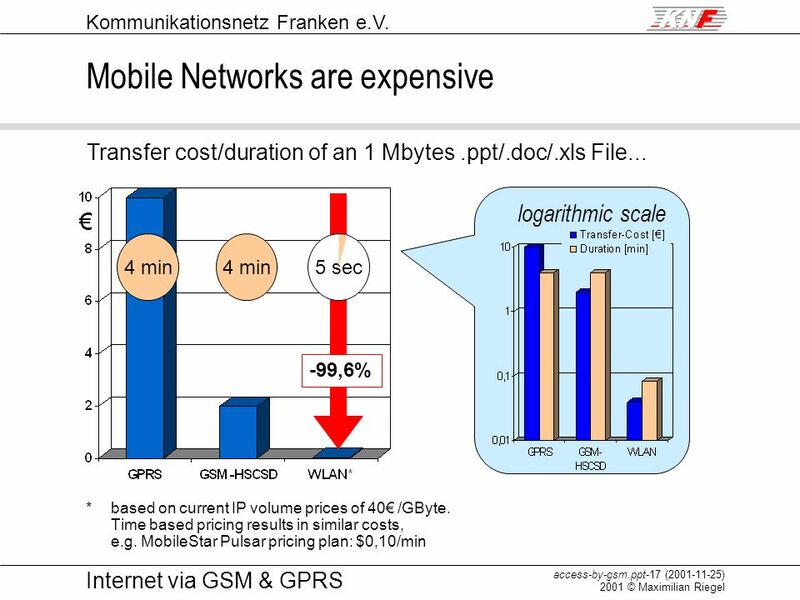 Most widely used: non-transparent data rate of 9.6 kbit/s. 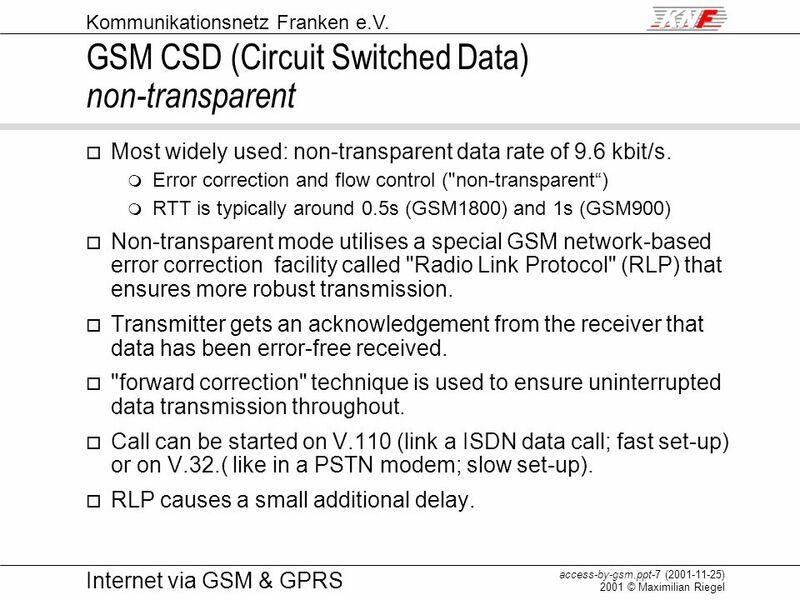 Error correction and flow control ("non-transparent“) RTT is typically around 0.5s (GSM1800) and 1s (GSM900) Non-transparent mode utilises a special GSM network-based error correction facility called "Radio Link Protocol" (RLP) that ensures more robust transmission. Transmitter gets an acknowledgement from the receiver that data has been error-free received. 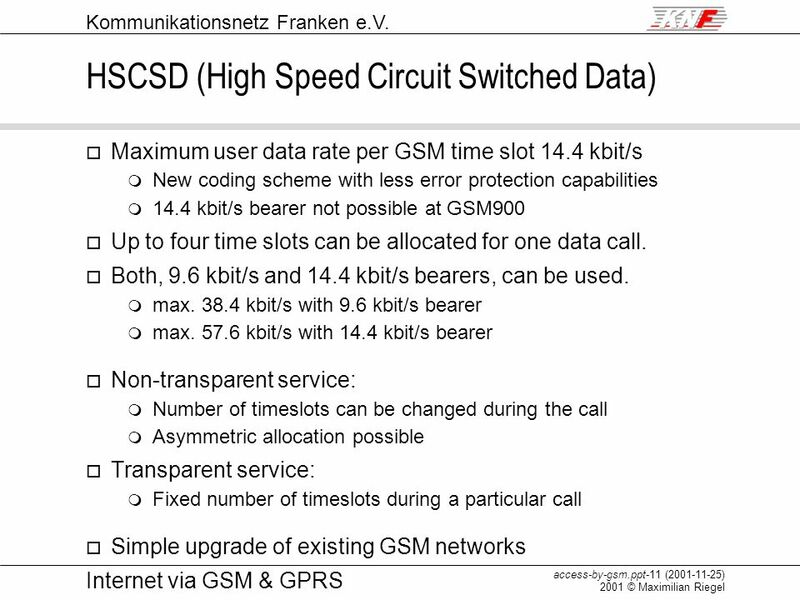 "forward correction" technique is used to ensure uninterrupted data transmission throughout. 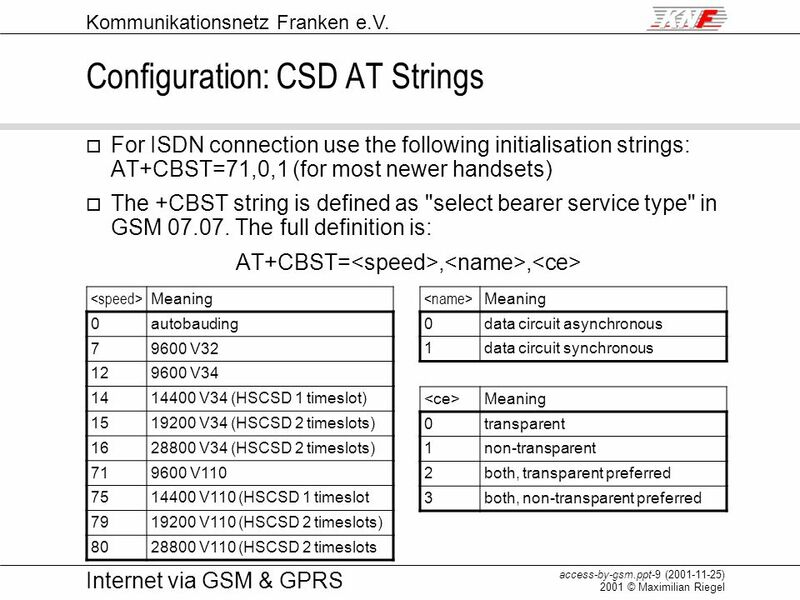 Call can be started on V.110 (link a ISDN data call; fast set-up) or on V.32. ( like in a PSTN modem; slow set-up). RLP causes a small additional delay. 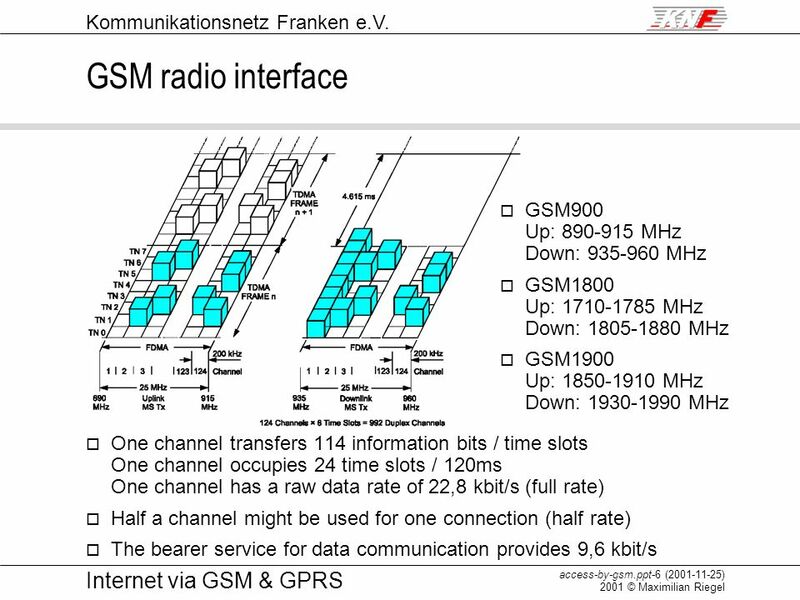 No GSM error correction supplied over the air interface. 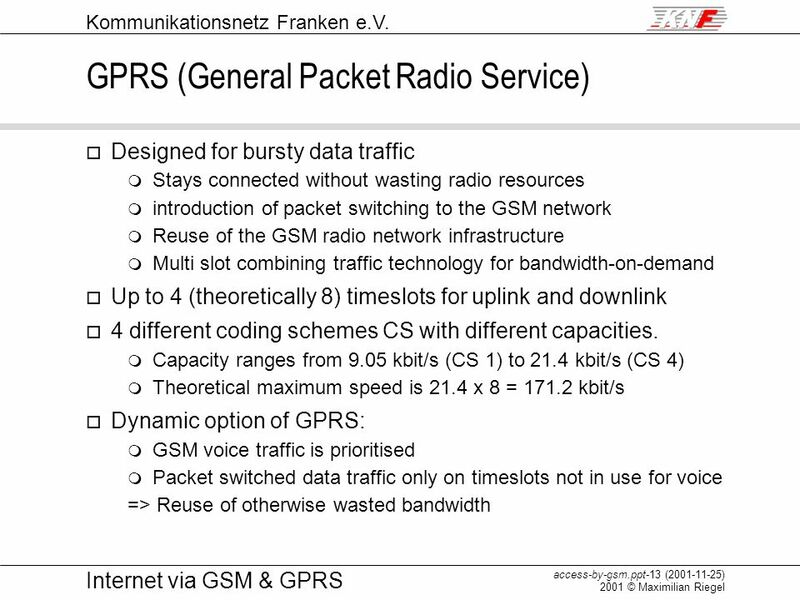 Standard for G3 fax transmission is a transparent protocol. 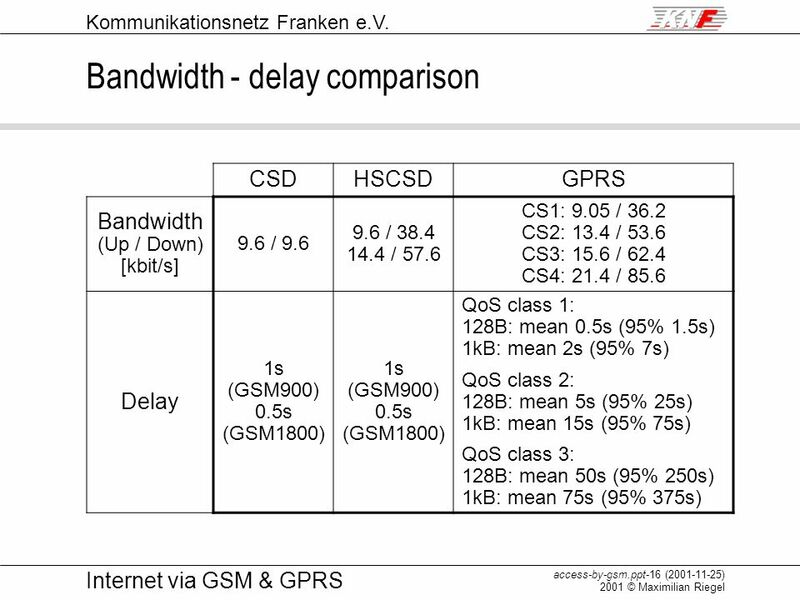 Most GSM networks support both non transparent and transparent data communications. 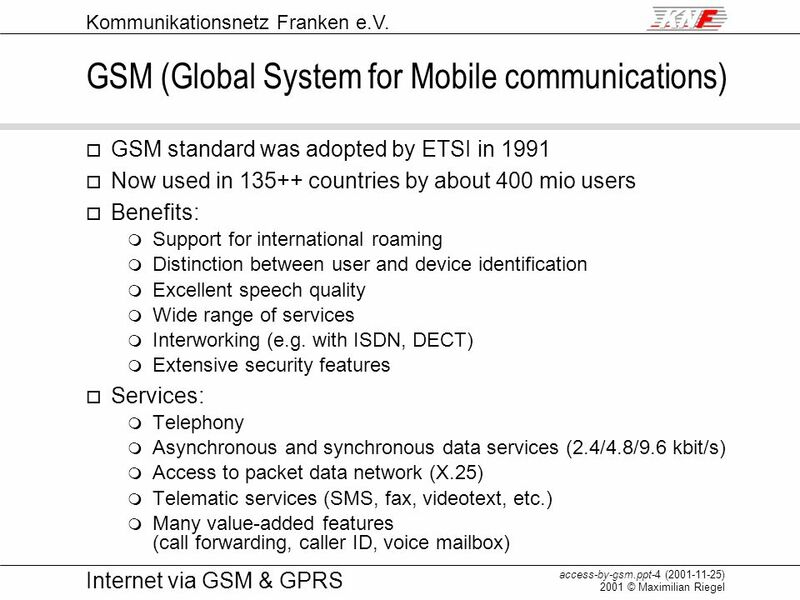 Can be started on V.110 (link a ISDN data call) or on V.32. 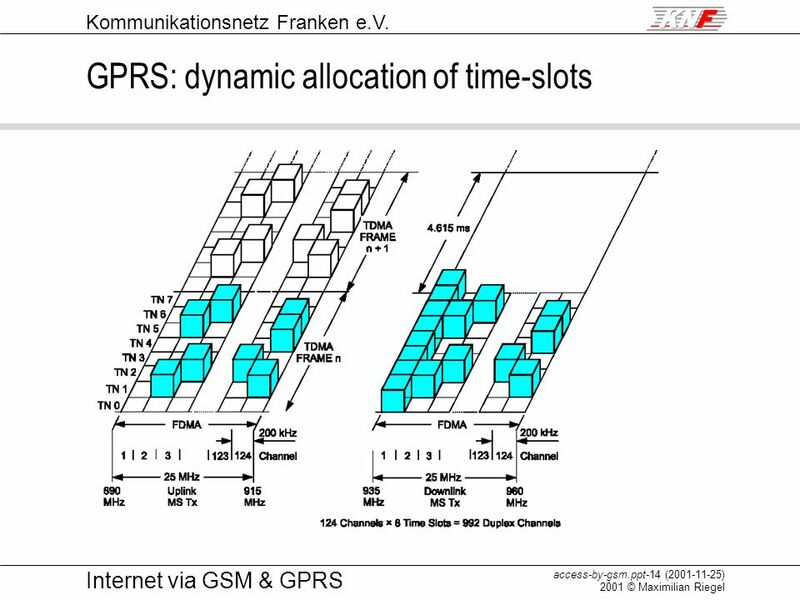 ( like in a PSTN modem). 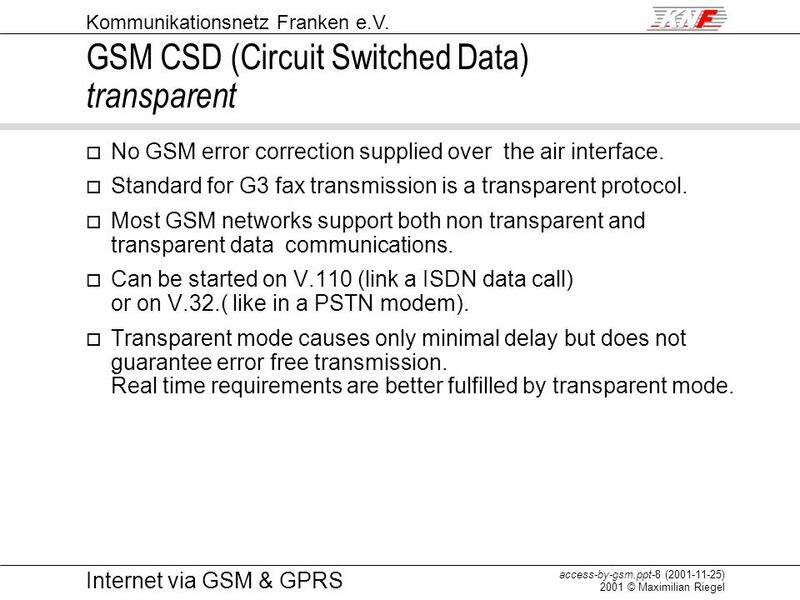 Transparent mode causes only minimal delay but does not guarantee error free transmission. Real time requirements are better fulfilled by transparent mode. Most mobile phones are equipped with modem functionality Connection to the computer might be realized by cable or IrDA Getting mobile internet access needs just the configuration of a new internet connection on the computer. 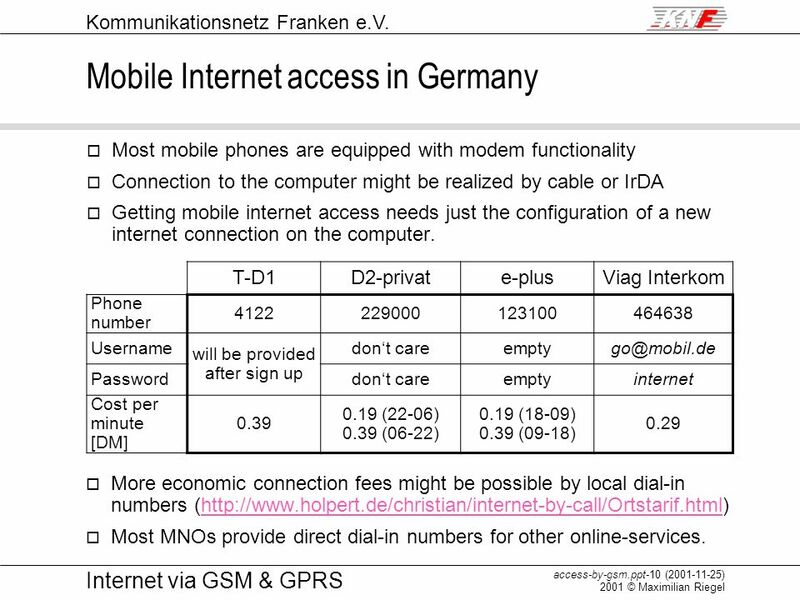 T-D1 D2-privat e-plus Viag Interkom Phone number 4122 229000 123100 464638 Username will be provided after sign up don‘t care empty Password internet Cost per minute [DM] 0.39 0.19 (22-06) 0.39 (06-22) 0.19 (18-09) 0.39 (09-18) 0.29 More economic connection fees might be possible by local dial-in numbers ( Most MNOs provide direct dial-in numbers for other online-services. 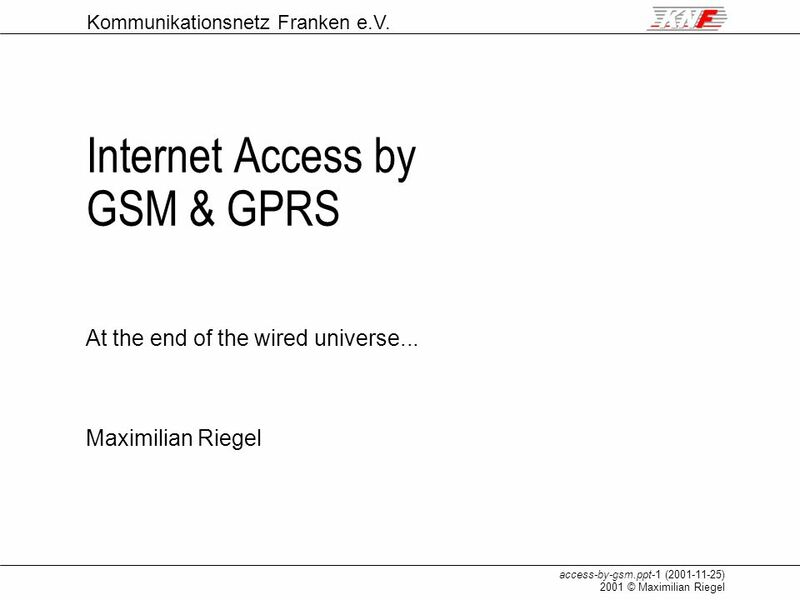 Download ppt "Internet Access by GSM & GPRS"
2/7/01 DRAFT Confidential & Proprietary Information, Copyright 2001, Symmetry Communications Systems p. 1 GPRS. Thema: Menü Ansicht, Master, Folien-Master 1 ITU - IP Telephony Workshop June Standards for IP-telephony P.A.Probst, External Relations Swisscom. 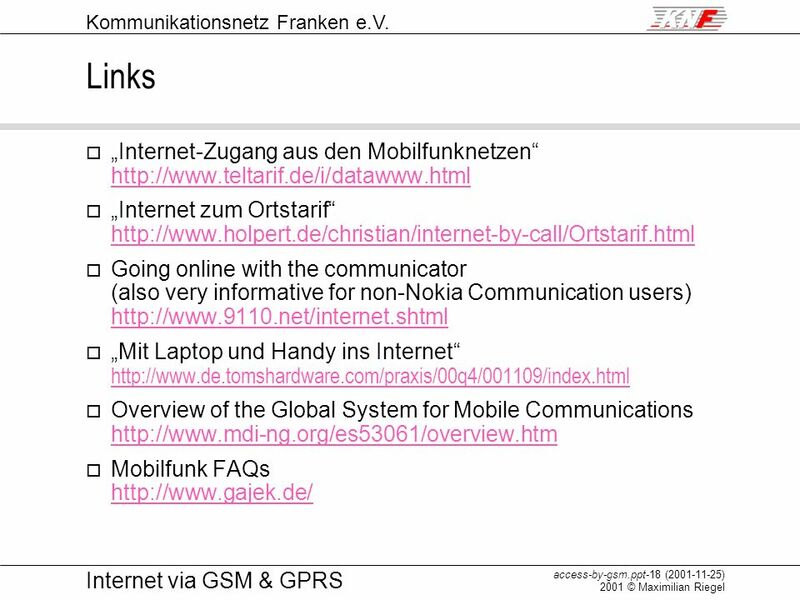 Mobile IP. 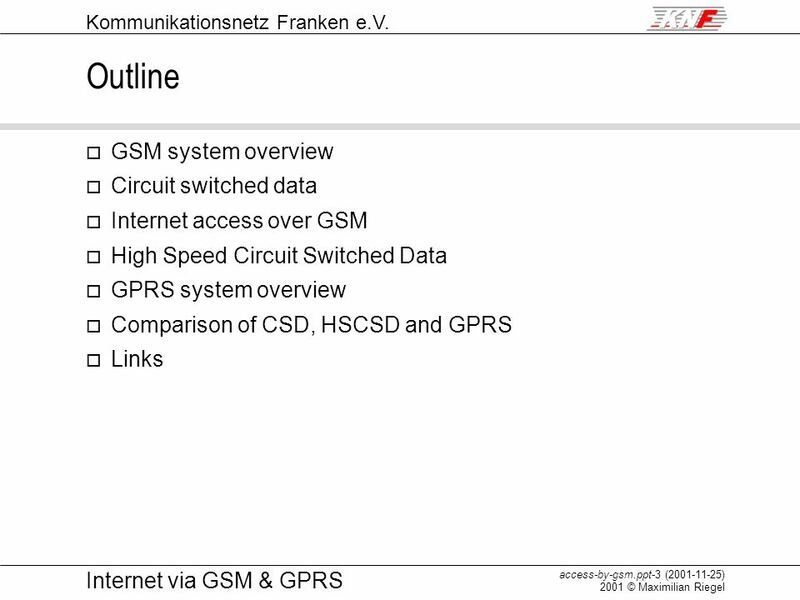 2 N+I_2k © 2000, Peter Tomsu 02_mobile_ip Evolution of Data Services Mobile IP GSM GPRS CDMA Other Cellular Circuit Switched Data Today Packet. 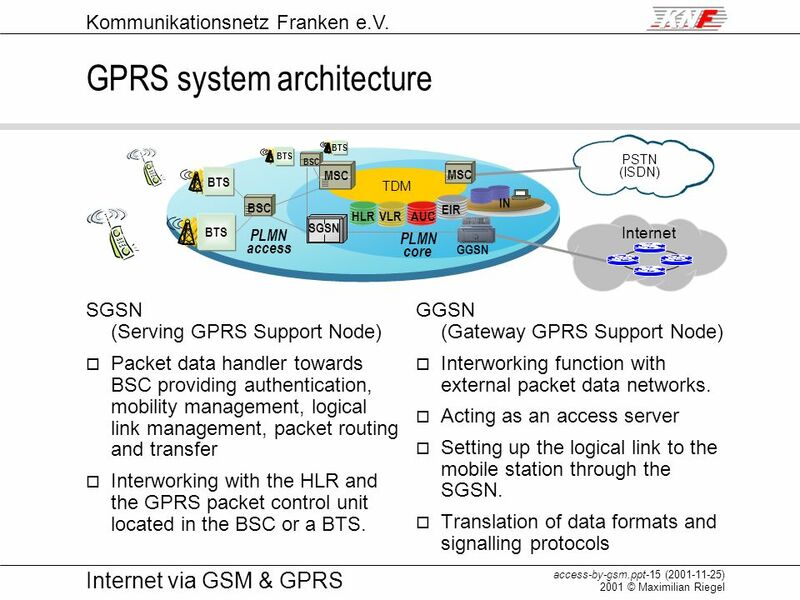 UMTS system Telenor FoU Josef Noll Page 1 UMTS system & planning aspects, Link and system level simulations aspects related to network. 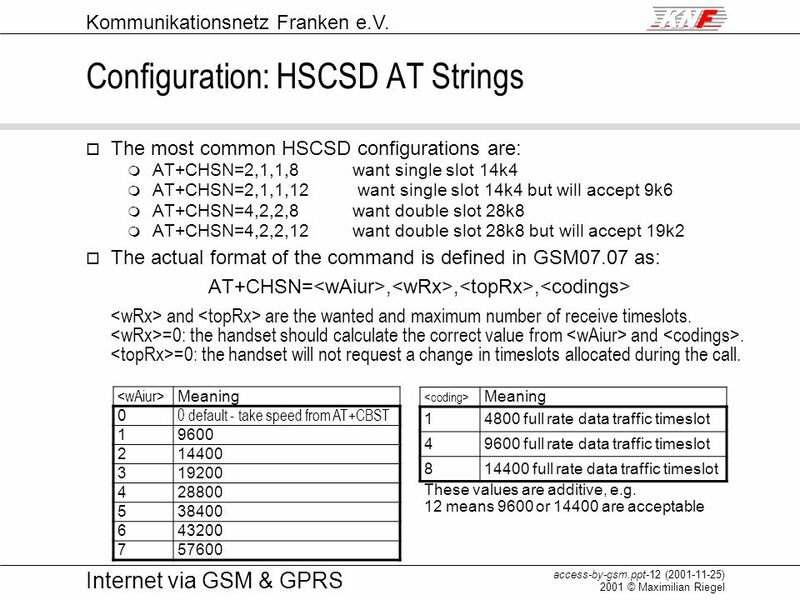 1 Introduction to Network Layer Lesson 09 NETS2150/2850 School of Information Technologies. Islamic University-Gaza Faculty of Engineering Electrical & Computer Engineering Department Global System for Mobile Communication GSM Group Alaa Al-ZatmaHosam. 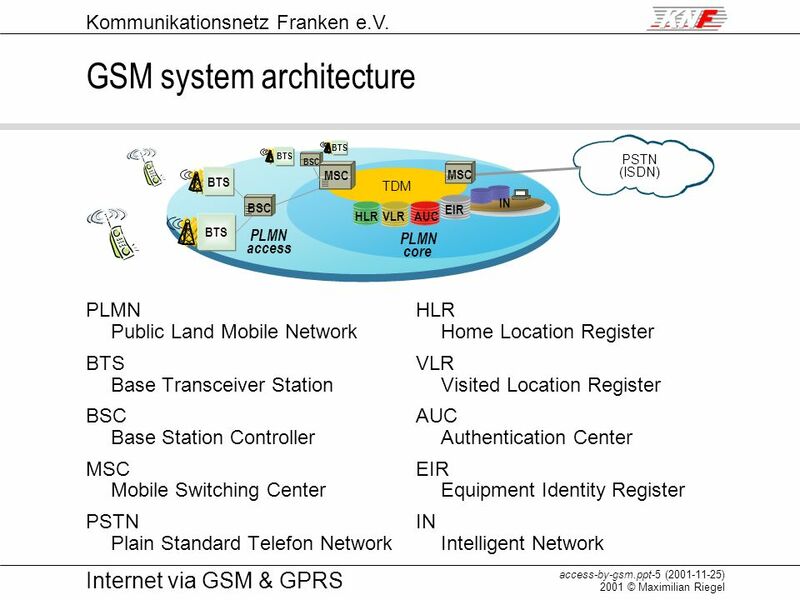 4.1 Architecture of the GSM system GSM is a PLMN (Public Land Mobile Network) – several providers setup mobile networks following the GSM standard within.